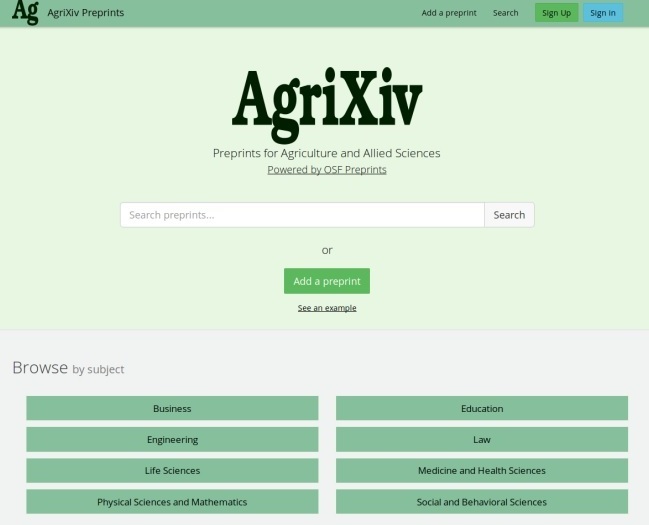 On 14 February 2017, the preprint AgriXiv site was launched with support from Open Science Framework (OSF), as part of fulfilling its objective of “development of community e-infrastructure, capacity building and framework for policies related to Open Access, Open Data and Open Education”. “Everything else can wait, but not Agriculture”, - Jawaharlal Nehru. (AgriXiv Home). Availability of preprints servers exclusively for agricultural sciences and allied sciences will facilitate the sharing of interim research for public good. Following the open access movement globally and the footsteps of arXiv , the researchers in other disciplines such as biological (bioRxiv/ASAPbio), chemical (ChemRxiv), engineering (engrXiv) and social sciences (PsyArXiv/SocArXiv) have also now started sharing their scholarly outputs with the help of preprints servers. The Open Access India - a community of practice advocating open access -, had taken up the initiative of establishing AgriXiv (agri archive) - a preprints repository for agriculture and allied sciences with the help of Centre for Open Science using their infrastructure, Open Science Framework (OSF). In particular, AgrXiv was pre-launched in early February 2017 on a staging server on GitHub and then formally launched on 14 February, on OSF. All the scholarly outputs as first or final drafts of working papers, preprints or postprints related to the subjects/disciplines of agriculture and allied sciences can be submitted to AgriXiv preprints repository to have a greater reach and also to maximize its impact. What Preprints can be deposited? Working Papers: Early drafts of papers being prepared for submission to any journal. Preprints: Finals versions of a paper being submitted for publication, excluding the ultimate production version produced by the journal. Postprints: Final version of the publication without any of the journal’s formatting and images. Advisory: Authors before submitting may look up “List of academic journals by preprint policy” on Wikipedia and also “Publisher copyright policies & self-archiving” on SHERPA/RoMEO to learn about the policies adopted by the journals with respect to preprints. Copyrights: The authors of the preprints submitted to AgriXiv owns the copyright on their own work and if they use others works in the manuscripts, they should check license to use or secure license before they submit to AgriXiv. However the works are licensed under CC0 or CC-BY and are shared immediately and publicly. Open Access policy: All the published preprints on AgriXiv are made available under Creative Commons license (CC0 or CC BY) as per the Author’s choice. However, CC0 is highly encouraged.